Well, we’ve done it! After reading every book I could lay my hands on, checking out a million blogs and other other online informational sources…I’ve picked a type of beehive, selected a company to make it, and placed my order. I am about to become a beekeeper! If you’ve been reading my adventures with raising quail, it will come as no surprise that I believe the best way to raise any sort of living creature is by figuring out what way of life they prefer…then giving it to them (as closely as possible.) In this case, I’ve come to the definite conclusion the way to natural, healthy bees is using the Warre Hive. Last night I attended my first (and probably last) meeting of the local beekeeping group. They were all extremely nice folks, and all wanted to be helpful, but wow. What an eye-opening experience! Not one of them uses anything other than the “traditional” Langstroth hive. The Langstroth hive is actually a very new concept in bee-keeping – a very invasive, non-natural way, that forces the bees to put out an excess of honey at the expense of their health and happiness. And our health, too. Using the Langstroth hive, beekeepers are functionally forced to use chemicals in their hives to control pests and diseases, and to artificially feed them sugar during the winter to keep them alive. Also, the Langstroth hive depends upon using pre-made honeycomb, instead of allowing the bees to make their own. This pre-made comb is either plastic, or beeswax taken from many other hives, or a combination. There is no way of knowing what chemicals or diseases this comb has been exposed to, and since it is re-used again and again in your own hive, the result is clearly problematic! With the Warre hive, the bees make their own honeycomb every year, so it is always fresh and new. It is also made especially to the bees’ specifications, and they are such master designers that it is complete foolishness to think we know better they they do how a hive should be run. 1) Varroa mite infestation. Varroa mites can be handled naturally, and a Warre hive allows you to do so. 2) Moisture within the hive. 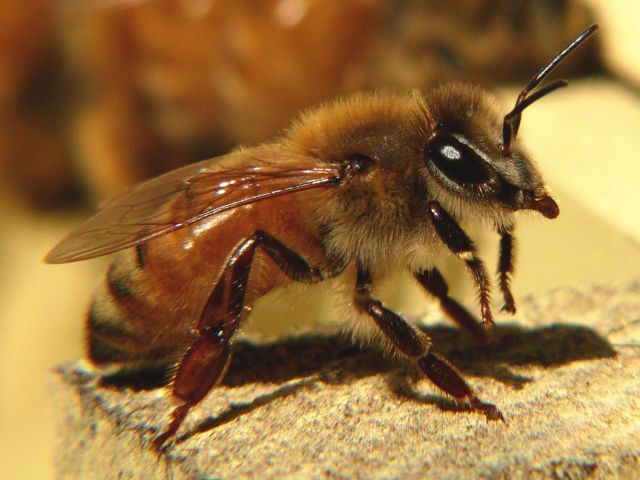 A Warre hive is specifically designed to combat this! 3) Starvation during winter. I intend to put my bees first. Until about 150 years ago, people didn’t harvest their honey in fall, but waited until spring. Fall harvesting means you have to simply guess how much honey your bees will need to see them safely through the winter – and some folks today will even take all the honey and just artificially feed all winter long. This is so wrong to me. If you wait until spring, you might end up with less honey, but your bees will be in no danger of starvation! There is conclusive evidence that the problems with the honeybee population is directly caused by invasive, unnatural beekeeping practices; practices that focus on forcing as much honey from the bees as possible, rather than on the overall health and well-being of the bees themselves. This is absolutely in line with what I’m seeing everywhere else in the modern world, when it comes to “controlling” and “managing” nature, and I find it an appalling thing. If a Langstroth hive were the only way to keep bees, I wouldn’t keep them. After everything I’ve learned and read, it’s become that simple for me. The Warre hive is the closest thing I can find to a completely natural experience for the bees, and as a side result, a beekeeper gets to have all the fun and almost none of the work. The only times you bother the hive at all is when you first install your bees, and when you harvest the honey. Each box on the Warre hive comes with an observation window, through which you can watch your bees without bothering them. Here’s a video from Sweet Valley Hives explaining the Warre hive. I have purchased my hive from them. And, as I was typing this, I just got an email from my bee guy. My bees have been scheduled to ship in April. The hive will arrive the first week of March, so that will give me plenty of time to paint it and get it set up and ready. I’m going to paint the hive yellow. The brightest yellow I could find! It’s called “Sunny at Heart” and it’s from Mythic Paint, which is the most non-toxic paint available. “Package bees for the 2014 season…Specially packed with our special essential oil enriched sugar syrup..NO CORN SYRUP…and a special pollen supplement to give them a head start. In today’s world the pesticides are decimating the honey bees and their best hope for survival is the backyard beekeeper. My bees will get to you in the best condition possible. And in other news, I realized I haven’t shown you any pictures of the two New Girls since they grew up and started laying. This is Isabelle and Elizabeth (Little Blue). Little Blue is a Blue Andalusian. She is extremely friendly, despite being foster-raised by one of my hens. She comes running whenever she sees me, and wants to sit on my lap. She also has the largest, most floppy comb of any of my girls…but even during our 12 degree cold snap, I had no worries about frostbite! Isabelle is a Cream Brabanter, and I just love this breed! She is so cute, with her feather crest. She is also very friendly, but she tends to be more of a ‘busy hen’ – less time to sit on laps, and more time out foraging. When I call the other girls in for a treat, she’s frequently too far away to bother coming…unless I call her by name. As soon as she hears her name, she calls back to let me know she’s heard me, then comes from wherever she is. 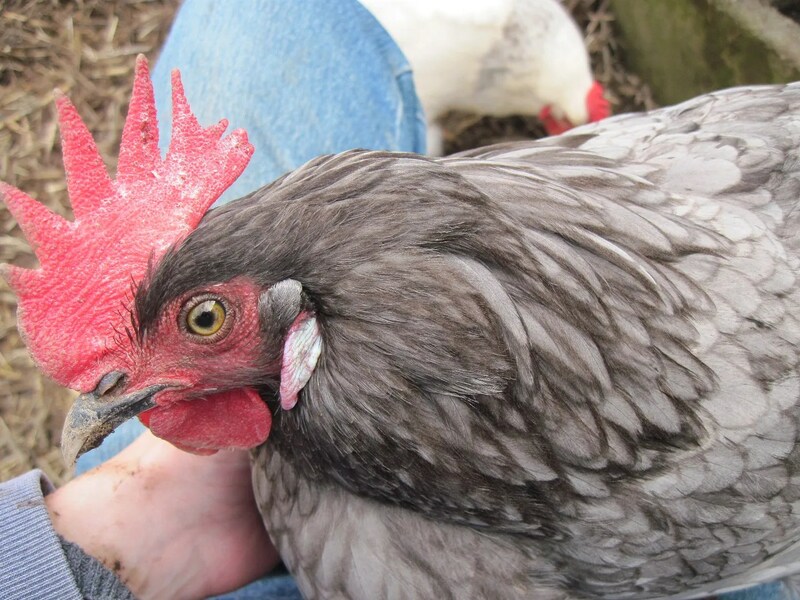 I never would have imagined that hens would learn their names like dogs, but not only do they know their own names, they know the names of the other hens as well. For instance, Ellie (my favorite and very spoiled hen) always gets annoyed with me when I call one of the other girls over to give them attention. And she actually growls in annoyance if I call Antoinette over, because she is not fond of how pushy Antoinette is. They are so funny, these girls! 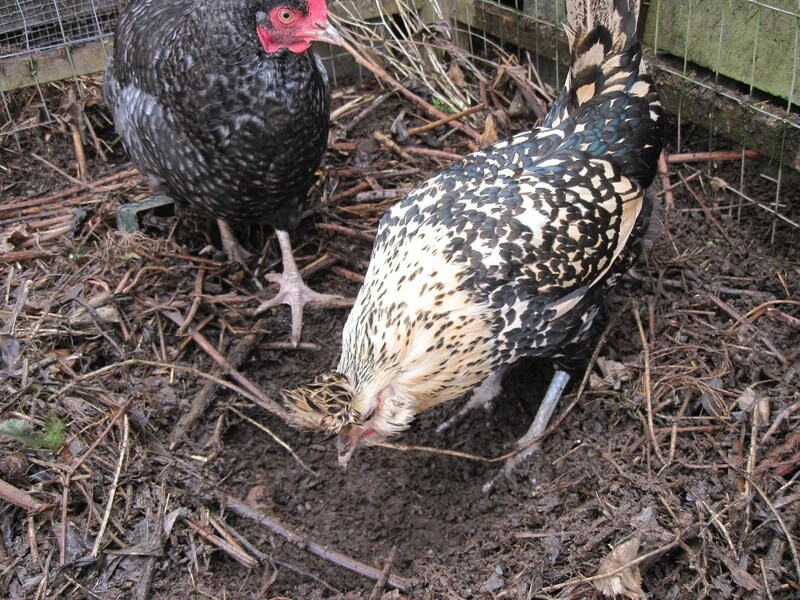 Assuming my trusty broody hen carries on her broody tradition, I plan to add two more girls to the flock. 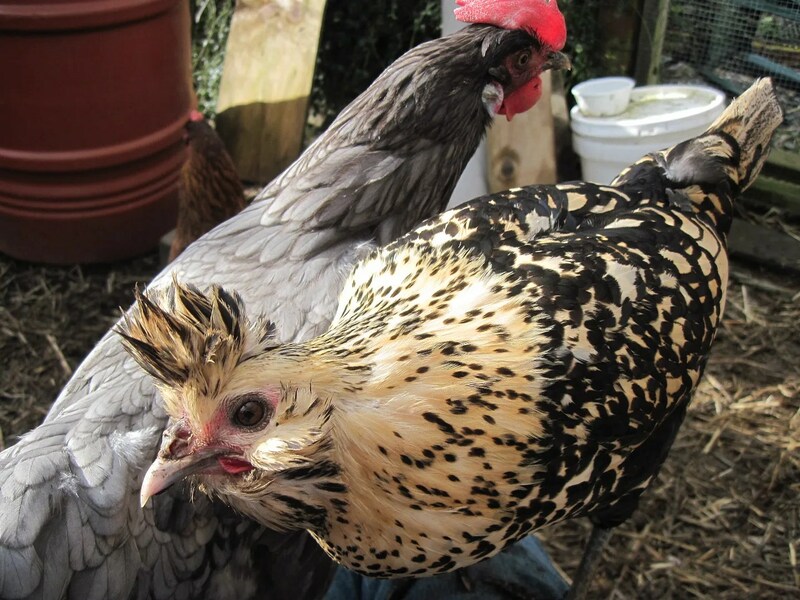 A Speckled Sussex, and another attempt at getting a female Ameraucana/Easter Egger. I want colored eggs, but I always seem to pick the rooster….! This entry was posted in Bees, chickens. Bookmark the permalink.